Okay, so it wasn’t just because Barcelona had Lionel Messi and Arsenal didn’t that the reigning Champions League title holders beat Arsenal today, even if the Argentine did account for both goals in the likely tie-deciding 2-0 scoreline. Unlike some of his most transcendent performances—like, say, his one-man demolition of Manchester City at this stage a year ago—tonight’s game was not one where Messi methodically unraveled an opposing defense single-handedly with his inimitable array of dribbles and passes and shots. No, this was a team performance—and it needed to be, seeing how complete and competitive a match the Gunners put together at home in hopes of overcoming their demons in this Midas-touched season of theirs. And yet the deciding moments in the game, the ones that turned what very easily could’ve been an Arsenal win into a commanding Barcelona advantage, came down in Barça’s favor because they had legitimate, super-elite forward talent like Messi to decide those moments and Arsenal didn’t. Check out how Neymar overcomes a loose second touch on Andrés Iniesta’s half-clearance, half-outlet pass, regains control of the ball before it’s taken from him, creates a couple of yards of space for himself between three defenders to find a passing angle, and flips the ball right into Luis Suárez’s feet to keep the counter alive. From there, Suárez quickly gets a read on his man’s position, sizes up the rest of the jagged back line he’s up against, and spots Neymar’s burst into the vacant space in the middle, all with just a glance or two, and with his first touch pokes a pass back into Neymar’s path. At that point, Neymar is free to sprint into open space with Messi to his right and only two defenders with any realistic hope of stopping them. The Brazilian resists the urge to drift further centrally to get into better position for a possible shot of his own and instead stays wide, dragging the defenders towards him and freeing room for the cutback pass to Messi he already has planned. With his weaker left foot, Neymar plays the perfect ball into Messi. 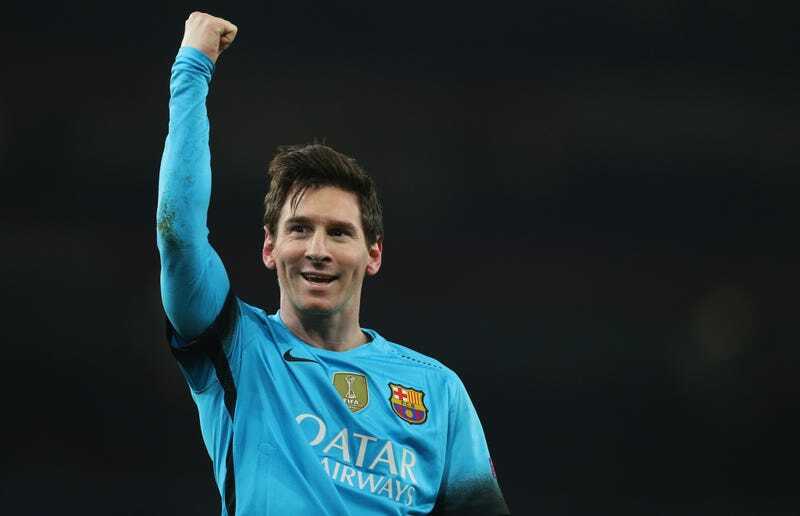 Messi’s preternatural cool saves him from the first-time smash shot that Arsenal keeper Petr Čech expects. Instead, he takes a settling touch as Čech skids to his knees and whips the ball past the keeper, past Nacho Monreal trying to cover the goal line, and into the net. This was in no way the most outrageously skilled goal Barça’s all-time great front three has scored this season, but it still required multiple instances of the elite levels of technique, awareness, decision-making, and execution that separate these three forwards from basically every other player playing the game today. In the other direction, Arsenal had several golden chances to score themselves, yet always came up short. At least two or three times, the Gunners found the ball sitting right in front of Marc-André ter Stegen’s goal begging to be blasted over the line, and not once did they manage to put it away. You can get the ball in front of the goal a couple times, but without the kinds of players who regularly turn chances like those into goals, it’s almost impossible to stand up against a team that does have goal-getting studs like that. Ter Stegen himself had a lot to say about keeping Arsenal off the scoresheet, making a couple heroic, goal-saving interventions, but you can’t help but feel that if it were Suárez nodding the ball towards the opposite post instead of Olivier Giroud, or if it were Neymar with the ball at his feet seven yards out and dead center in front of goal instead of Alex Oxlade-Chamberlain, or if it were Sergio Busquets sliding in to stymie a quick-developing attack rather than Mathieu Flamini, the scoreline would’ve been different. In many ways, today’s match fell exactly how Arsenal would’ve wanted it to. They faced a Barcelona team that has looked so exhausted of late entering their third match in six days; the Gunners benefited from a number of the blaugrana side’s textbook shortcomings that threaten to derail them during their rare moments of vulnerability—their inconsistent control of the tempo of the game, Suárez’s completely baffling distaste for scoring easy goals (he should’ve scored at least twice), and the forwards’ predilection for making one pass too many in the box. But because Barcelona are still Barcelona—armed with a strike team featuring three of the top four players on the planet, three of the best midfielders in the game, and a playing style that maximizes the talents of every player—the small margins of their superior talent eventually overwhelmed Arsenal’s tenacity and dedication.